What's more, the princes are Stupid But Adorable to a degree that can occasionally be eye-rolling. ("Stupid" is a slightly harsh word, but I'd have been flattering them if I settled for "silly" and you wouldn't let most of them out on their own.) 1. Leonhard is so allergic to schoolwork that he can't calculate one plus one, despite being almost an adult. 2. Bruno will end up hero-worshipping Haine so much that he's like a duckling with its mother. 3. Kai's so bad at social interaction that you'd swear he's retarded. (The show wants us to believe that strangers find him scary, but no. He delivers his dialogue in the manner of someone who can repel hostile psychic powers because he's got the mind of a two-year-old.) 4. Licht is the only one you'd expect to survive if dumped into the real world, but he acts and talks like an empty-headed flirt. That said, though, what's good about this anime? The boys all get significant character development. They learn from Haine. They start out as over-privileged brats with severe personality issues and a hatred of all teachers, courtesy of the string of inadequates they've been given until now. By the end of the series, they've acknowledged their problems and taken significant steps in overcoming them. It's also amusing, if you're in the mood. Overall, it's okay. I watched it. It wasn't a slog, even if it was never top of my list. 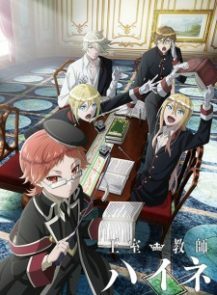 Right now, I've found myself watching a queue of shows that don't match my usual tastes, with this, Fate/Apocrypha and Dakaretai Otoko 1-ni Odosarete Imasu. I wasn't racing to watch it, but I plodded through quietly enough and was usually okay with it. It didn't make me fast-forward or anything. It's a light-ish, silly-ish bit of fluff with cute boys being cute, with the twist that they're princes. (Ep.7 does a version of the end credits with the voice cast performing the song as an idol dance routine.) At the same time, though, it has enough semi-drama and character development that you can follow it without having to wear your Irony Head. Haine's teaching role is taken seriously and he does help the boys grow as people. I didn't keep the episodes after I'd finished and I wouldn't really recommend this to anyone who doesn't already watch Pretty Boy Anime, but it's not too bad.